... but even this last officially sponsored website is deeply flawed in that it is too detailed (about trivia) and almost all guides inevitably recommend some really awful tourist traps (e.g. ; the first restaurant Spaintour mentions by name offers simply dreadful food!). I'm always suspicious of any kind of guide which recommends commercial places by name. It this advertising? Do they get a percentage? Why is X restaurant full of, let´s say, Frommer Guidebook-readers while the much better eatery next door is empty? One thing most of these Guides neglect to mention, and I think this is one of the main reasons travelers flock to Barcelona, is that this city is lots of FUN and AFFORDABLE! The upper and middle part of town is as elegant and cosmopolitan as any European city, and sometimes even surpasses them all for the designer chic of its stores, bars, and restaurants. But walk 15 minutes (or 5 minute and 6-Euro taxi ride) in any direction and you can visit pockets of different old-towns, now absorbed into metropolitan Barcelona, with their narrow streets and old-world charm, and you feel as though you have travelled through time. Climate is always a factor when planning a holiday. Barcelona's average yearly temperature during the day is a very comfortable 19.5ºC (70ºF). With global warming and erratic weather generally, it's hard to say when it rains (in '97 and '98 it hardly rained at all, and local authorities are studying plans to divert water all the way from the Rhône in France), but usually there are a few days of rain in Autumn and Spring. Because of the sea, humidity is often a factor, exacerbating summer stickiness and winter chill, though today, January 30, 2000, it was 17ºC and the beaches were packed. Barcelona is full of tourists year-round, especially now that the city hosts so many important trade shows and conventions. Travellers in August should know what a good part of the city shuts down for most of the month. (Goethe's dictum about Rome in August also holds true for Barcelona.) Nevertheless, I find the city especially seductive in summer, when the beaches are full, plenty of interesting traveller´s about, everybody taking it easy, and there is little to no traffic, so exploring the city is a joy. It is a time of year for long rests at terraced cafés... and at night you have the festivals in Gracia or in Sants. The liveliest time to visit Barcelona is during the city's festival of La Mercè during the third weekend in September. Traditional cultural events share billing with a dozens of free concerts, museums are free, and there is even an air show and ambitious firework display on Sunday. In fact the months of September and October are very lively (what the French call la rentrée) and the buildup to Christmas and New Year, with Christmas displays and colorful street lighting and plenty of musical events, are also great times to enjoy the city. A number of Barcelona's best quality hotels and apartment-hotels are situated in areas that many locals would consider the boondocks. I should think most visitors would want to be closer in to the heart of the city, say, near the old town or around the Passeig de Gracia. Barcelona is a city that is best admired on foot, with a vast array of truly astonishing buildings of every architectural style, and seemingly, an inviting café or tapas bar on the ground floor of each one of them. Though public transport is excellent and taxis are inexpensive, why commute if you are going to end up spending all your time in the city center? Oh, and the Ramblas is a nice place to visit, but you probably don´t want to live there. The first thing I'd do is pick up tourist info and maps at the airport or train station upon arrival. The free McDonalds map they give you is an embarrassement so spend a couple Euros on a decent map with a close up map of the old town and a metro map. As for tourist attractions, in a nutshell, here are some of my favorites. 1) Do the Rambla at least once during the day and again once at night after dinner. Be sure to visit the Boqueria Market, also called the Mercat de Sant Josep. 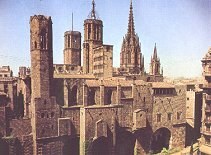 Walk over to the Cathedral and around the Gothic quarter. Cross over Via Laietana to the Basilica of Santa Maria del Mar and the Montcada street artisan area called el Born, then on to the Ciutadella park. The area around the MACBA on the other side of the Rambla is also an interesting arty zone. 2) Walk up the Passeig de Gracia from plaça de Catalunya to the Diagonal, go a block to the left, and walk back down the Rambla de Catalunya. The entire neighborhood is full of fantastic Modernist/Art Nouveau buildings and many elegant shops. Remember, Gaudí was only one of many talented art-nouveau architects. There are several important art-nouveau buildings on just about every street in Eixample, and many more in Gracia, Sant Gervasi, Sants, ... and even in the old town and Barceloneta! 3) Taxi, bus, or metro over to the Sagrada Familia, then walk up the Avinguda de Gaudi to the Hospital de Sant Pau, checking out the interior of the main pavilion's stairway on the left. 4) Taxi or take the nº 25 bus from in front of Sant Pau to Park Güell (especially nice on clear days to take in the cityscape backed by the Med.). Hint: the taxi to the park is nice because it leaves you at main entrance (entrada principal). The northern exit in middle-right hand side of the park is where you can get a nº 24 bus all the way back to Plaça de Catalunya. 5) In the evening, catch a concert at the magnificent Palau de la Música, or an Opera at the newly refurbished Liceu, or head over to the National Theater or Auditorium for other high-brow entertainment. All concert listings can be found in the "Guia del Ocio" or in any newspaper - available at kiosks. On Thurs, Fri, Sat and Sun nights between 9 and 11, see the fantastic Magic Fountain at Montjuic above the Plaça d'Espanya, one of the highlights of any trip to Barcelona. Truly magical! On Saturday evenings at dusk, watch Sardana dancing in front of the Cathedral, and again on Sunday morning in Plaça Sant Jaume. There is a book fair on Sunday mornings at Mercat de Sant Antoni, and the flea market over on Plaça de les Glories can be interesting, but the best stuff is sold off early in the day. 6) Once you've done all that, you can do Montjuic and its fantastic museums (esp. Fundació Miró), the botanical gardens (my favorite is the little visited cactus garden just above the port) , and Olympic sites (maybe using the Montjuic bus from Plaça d'Espanya to get around). Or you can walk along Barcelona's seafront, from the fisherman's quarter of Barceloneta to the tacky Olympic pleasure port areas under the twin towers or the Maremagnum closer to the bottom of the Rambla. Or visit any of the dozens of top-notch museums I've so far neglected to mention (the Monastery of Pedralbes with the Thyssen-Bornemisza Collection is out of the way but well worth the detour. The Picasso is quite frankly over-rated, but getting better all the time!). You will have now scratched the surface of what this most exhilarating of Mediterranean cities has to offer. Often the street atmosphere in Barcelona is so lively, joyous, and carefree that visitors are lulled into a false sense of security. But as in any major European city that is a popular tourist destination, Barcelona has its share of bag-snatchers, pick-pockets, and street scams. These tend to concentrate where the tourists go, namely on and around the Rambla, in the metro, and at park benches. Don't tempt fate, leave your stuff in the hotel or apartment and just carry what you need, like a photocopy of your passport instead of the real thing. Violent muggings are almost unheard of in Barcelona (Disney world in Florida is statistically a more dangerous travel destination), but petty criminals are very adept at exploiting any opportunity..... such as a handbag hanging from the back of your seat in a terrace café, or you´ll get "accidently bumped into" while going in to the metro, and Gypsies will try to sell you roses while their diabolically cute little kids get at your wallet from behind.... and the Northafrican youths will try to open your car door or trunk (boot) when you are stopped at traffic lights. Then there is the seedy side of town. For example, the architecturally lovely Plaça Real, just off the Rambla, is a favorite hang-out for down-and-outs from all over Europe and North Africa. Oddly enough, well-healed tourists seem to love to watching the drunks and the toothless junkies from Plaza Reial's tourist-trap terraces while downing insipid and over-priced microwaved paella... like at the horrible restaurant there (unnamed) with the long queues for a table. Locals know that that restaurant has no real kitchen. It is part of a chain and all the food is prepared in industrial estates and brought in to be briefly zapped before serving! Of course, I don't want to scare anyone away from Barcelona, and I especially don't want to dissuade you from fully enjoying the old town, as it is the neighborhood I have fallen in love with and have decided to make my home (22 years now, only!). As you will see, it undoubtedly one of Europe's great treasures, (some might say an uncut gem) and my wife and I live near the Rambla and we feel safe walking around at all times of day and night. (As always it is a question of attitude, street-smarts, and knowing the language. They don´t rob locals as we´ll be around to press charges if they get caught.) While the rest of Barcelona is hyper-civilized like any other rich European city, the old town retains, along with over evidence of over 2000 years of magnificent architecture, its exotic appeal - a mix between Sunday afternoon promenade in Rome and General Amnesty day in Marrakesh. We love it! - From the airport, a taxi into town would cost approximately 18 Euros depending on traffic and the number of bags you have. There are, however, two very good alternatives: 1) the distinctive blue and yellow Airport Bus departs from in front of each airport terminal, costs about 3.30 Euros - 20 minutes, and stops at Plaza de Espanya and at Plaça de Catalunya, the city's transport hub at the top of the Rambla. 2) The Airport trains are somewhat less convenient as there is more walking involved, but 2.15 Euros will get you to several train stations (Sants, Passeig de Gracia, Arc de Triumf) which are linked to the metro system. - The double decker open-top "Bus Turistic" goes around to Barcelona's major sights and is quite handy for those who want to see a lot of Barcelona. It costs 25 Euros for a day ticket for adult and 14 Euros for kids up to 12 and you can follow the two big routes throughout town, getting on and off at will.. Two day passes are somewhat less expensive. Buses pass by every 20 minutes. If you plan on seeing only a couple sites in town - say the Sagrada Familia and Park Güell - then you can take taxis more cheaply than paying for the Bus Turistic, which I think is shockingly overpriced when compared with the price of taxis. - If you need information of any kind, don't hesitate to just ask any local passerbyer. They may not speak your language, but unlike in other European touristic cities, the people here tend to be genuinely nice, unstressed, and happy to be of help. - Almost every restaurant recommended in tourist guides have paid money to get in the listing, and they make up for advertising costs by skimping on the quality of your meal and underpaying their waiters... Try to eat in places full of locals. If you see a lot of blond people with cameras at the tables, you'd probably do well to move on! - Locals tend to eat an inexpensive three course "menu" or prix fix meal in restaurants at midday and light meals at night. You would do well to adopt the custom. For more on Catalan food and eating habits: go to our food homepage in left-hand scroll bar. - Mercat means market. Most families in Barcelona still do their shopping daily at the mercat, where they line up at a series of market stalls and specialty shops. Going to the market involves social and commercial activity. Neighbours catch up on gossip and enjoying the hustle and bustle of the marketplace, while also providing a livlihood for real people, the fruit, meat and fishmongers who really care if you choke on their food or not... But if you want to be modern, you can buy celophane packaged or artificially coloured meats and vegetables and a bewildering supply of junkfoods at exorbitant prices without having more human contact than handing over your credit card to the brain-dead dyed-blond cashier in a supermarket, such as at the basement store of the Corte Inglés on Plaza de Catalunya.